The first scene had a really interesting atmosphere, there was something really weird about the scene. But weird in a good way, it was a really visually odd scene, I can’t quite describe why I was so transfixed by it, it was just so strange and darkly comic. The scene was inside a hall in Arkham Asylum with a stage play being performed for the inmates. There is a thunderstorm outside, but indoors a crowd of dangerously insane criminals sit quietly watching this odd play. The actors in the play are all clearly inmates as well and there is something really over the top and ridiculous about the play itself. The characters are all wearing silly crowns and ridiculous costumes. James Gordon keeps a watchful eye on the inmates to make sure no fights break out, the whole time displaying the expression of confusion and fascination that I was. It had a really gothic tone, the whole thing looked very much like something out of Tim Burton’s Batman movies, perhaps that was the intention. I believe the reason the tone of this scene echoed Michael Keaton’s and Tim Burton’s tenure as the caped crusader was because something whimsical was happening amongst crime and darkness. 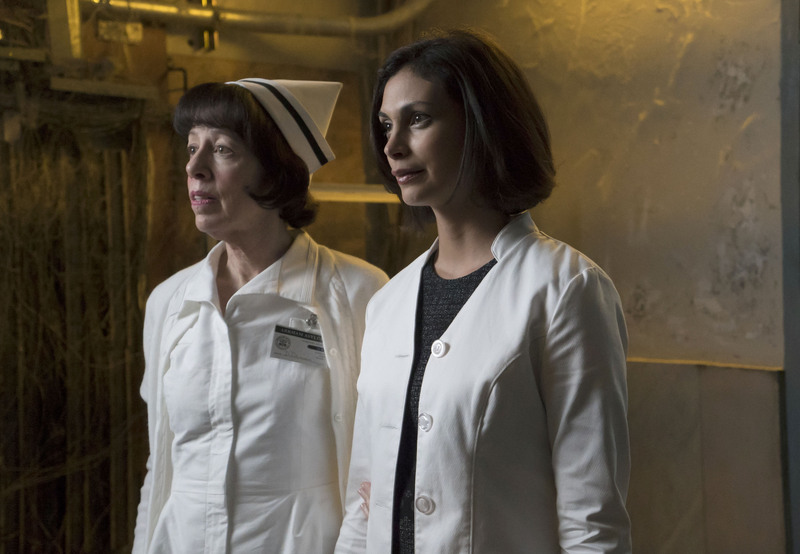 The first appearance of Morena Baccarin as Dr Leslie Thompkins was in quite a nice scene early on in the episode. Morena Baccarin is awesome, if you haven’t seen any of her work yet you should check out Firefly, in which she had quite a big role. Firefly was a beautiful cross between cowboy/western and sci-fi it sounds odd I know but trust me its fantastic, shockingly underrated and was cancelled after it’s first season because the network were idiots. I liked the character of Dr Thompkins, the occasional moments in which Gordon and Thompkins would catch up and discuss how crazy Arkham Asylum is were a breath of fresh air. The brief moments between Cat and Ivy throughout the episode were quite nice, good to see that those characters are being developed slightly rather than just cropping up to have an adventure occasionally. It was good to see The Penguin again, the presence of Oswald Cobblepot is always welcome. Cobblepot is fascinating to watch as he is such a master manipulator and he is brutally evil, there aren’t a lot of interesting characters on TV at the moment that also kill without remorse. This episode is the first time Batman fans have got a live action look inside the corridors and rooms of Arkham Asylum. It has been explored in video games and animated movies, but never really films or TV shows. It was fascinating to explore even more of this world, I like having these locations in my head, I feel like I have a real idea now of what Arkham looks like in that universe. There were a few moments in this episode where the Gotham city scape looked really beautiful, the producers know that it isn’t a good idea to make every aspect of Gotham dark and miserable. For the audience to connect with this imaginary city it has to be a mixture of darkness and a strange beauty. There was a myriad of interesting inmates, Arkham provided some fun and fascinating scenes due to the wealth of unpredictable characters. Detective Bullock’s appearance mid way through this episode was welcomed also, I did spend some of this episode wondering where he was. The writers introduced him back to the audience with a really fun scene for him, Donal Logue has a really good delivery of comedy lines which he demonstrated in this scene when he reacted to a particularly out there inmate. 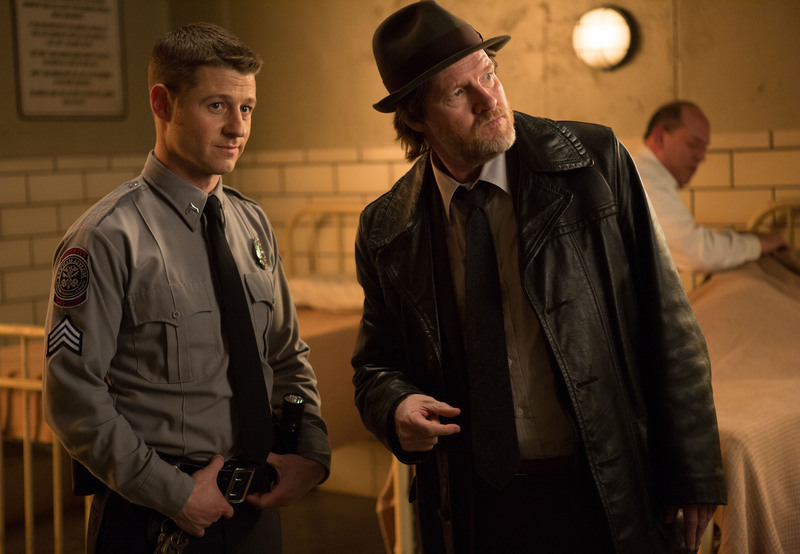 Robin Lord Taylor and Donal Logue are two of the best actors on the series so a scene that was the two of them just talking and feeding off of each other made awesome viewing. 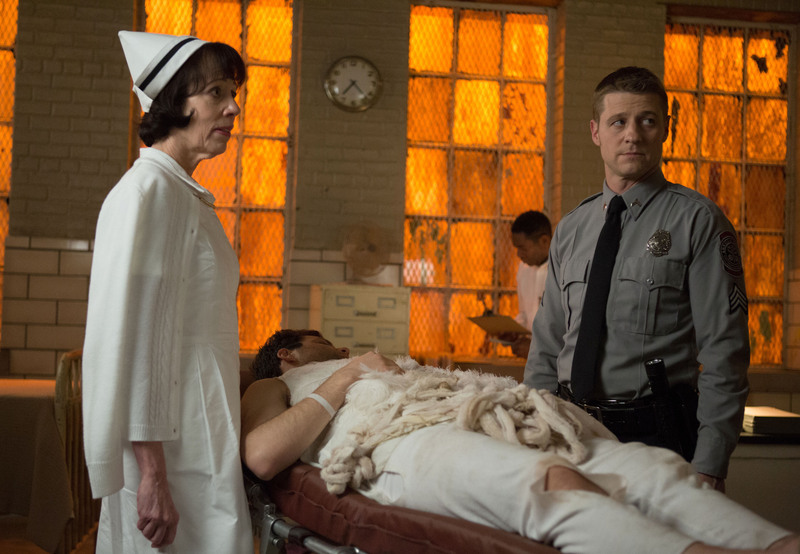 This was a really strong episode it was a real return to form for Gotham. I have struggled with getting excited about this show, however Gordon being sent to Arkham Asylum has really mixed things up and revitalised the show completely. It was a really good idea done right. The story was interesting and the episode’s central mystery had a satisfying resolution. 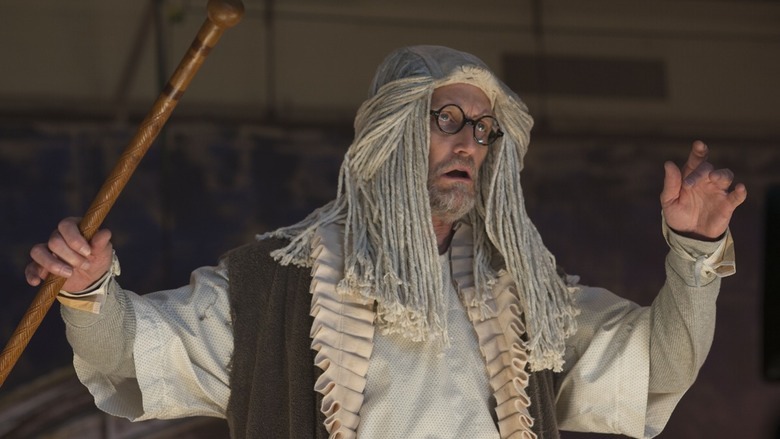 Gotham’s mid season premiere also saw the introduction of a pretty creepy villain that I hope will be an antagonist throughout the remainder of season 1.